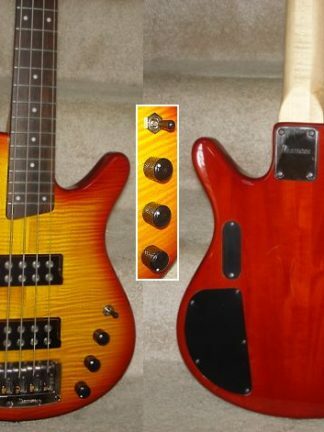 The G2 (aka Scorpion Gothic Bass) is actually a new-old-stock model from 10 years ago and is fairly model produced during Burns USA’s ownership of the name. Historically, Burns London, originating in the 60’s, was always thinking outside the box including this baby, perhaps the most evil looking bass I’ve ever had. This model is actually an update from the 80’s model and a very well made bass that was crafted in Korea Features P and J pickups with 3-way selector and mini-toggle for phase switching which allows a lot of cool collection of tones. Also features basswood body, hardrock maple neck with rosewood board, 34″ scale, Scorpion headstock with Burns Deluxe tuners, Burns Deluxe tailpiece, pearloid neck binding, and deep cutaways allow for easy access to the upper frets. Check out the Scorp in detail here. 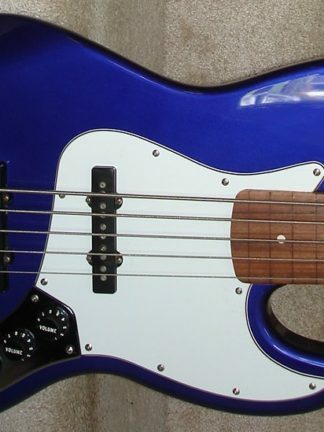 With a list of $899, these sold in stores for $659 but this one is perfect with plastic still on the pickguard AND pro-setup prior to shipping – for just $459. It’s hard to find a gigbag to fit this but I have a very plush EI gigbag (pic here) with leopard print lining that will fit it – for $29.